Golden Symphony, oil-on-canvas painting (212x282cm) by Hoàng Định. A series of paintings by Vietnamese artist Hoàng Định and his Dutch colleague Somsak Chaituch will be on display this week at the Việt Nam Fine Arts Museum. Hồng Vân reports. Hoàng Định is among the very few painters in Việt Nam to follow abstract expressionism, a form of art that is often characterised by flamboyant strokes and emphasises free, spontaneous and personal emotions. He will exhibit his finest paintings at the Dancing Colours of Nature exhibition, which will run at the Việt Nam Fine Arts Museum from October 28 to November 6. The exhibition is the perfect mix of 14 oil paintings in the style of abstract expressionism by Định and Dutch painter Somsak Chaituch. As in music, the collaboration between east and the west, opera and eastern traditional music, between the seven notes and the pentatonic scale still seems to cause malfunction, but the way Chaituch and Định complement each other is just charming. While Định’s paintings are full of beautiful optimistic images of northern Việt Nam, the paintings from the Dutch painter reveal a remarkable depth of Nordic art. Định’s technique is free and improvised, almost with no intention to end within the frame, which seems to be the opposite to Chaituch’s extraordinary elaborateness. One can enjoy the fresh air in the vast scenic rice fields in northern Việt Nam with Golden Symphony, get lost in the rustling sounds in the Melody of Bamboo, feel the sweet rhythmn in Lakeside Sonata or indulge themselves in the youthful romance of Summer Prelude. The landscape of Việt Nam is always an endless inspiration for Định. “The themes of landscape and life have long been a great inspiration for artists. They can have a strong impact on our souls as they are the things that are most close to us. Yet I want audiences to feel the breadth of modernity in my works,” said Định. He will showcase eight paintings at the exhibition. Looking at his paintings, one feels like they can hear the sound of bubbling water, feel a gentle breeze or sense soft movement in the leaves. Định’s paintings are characterised by the details that give viewers not only visual signs but also physical vibrations, emotional states as well as sentiments of time. 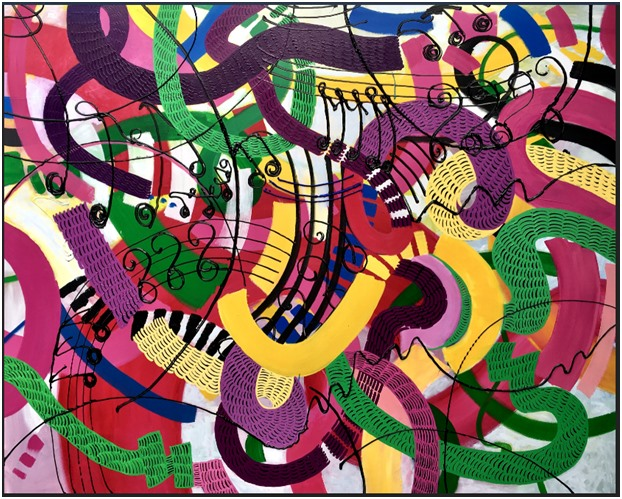 “Each abstract expressionism painting transmits the energy of rhythms directly to viewers. Abstract expressionism is not simply about describing a slice of reality. Like music, it stands independently from the physical world to become extraordinary. “Abstract expressionism can describe time and space in an unimaginable and special way,” said Định. Melody of Bamboo was awarded Giulio Cesare – Art Emperor prize in Rome, Italy in July. Paintings from the Dutch painter Somsak Chaituch reveal a remarkable depth of Nordic art. Abstract expressionism is a broad movement in American painting that began in the late 1940s and became a dominant trend in Western painting during the 1950s. Spontaneity or the impression of spontaneity has characterised many abstract expressionists’ works. “When it comes to the subject of nature, it is important that the painter can convey the sounds of nature as well a sense of space and time through their paintings,” he said. Định was awarded the prestigious Raffalello prize in Bologna, Italy in May for his oil-on-canvas Sunset in Mangrove, and the Giulio Cesare – Art Emperor prize in Rome, Italy in July for another oil painting Melody of Bamboo, which is featured in the exhibition. He is well-known for his optimistic style that is well blended with impressive and expressive influences. “What is so unique about Định’s paintings is that they incorporate both international artistic language and traditional folk culture,” said painter Dương Hướng Nam. 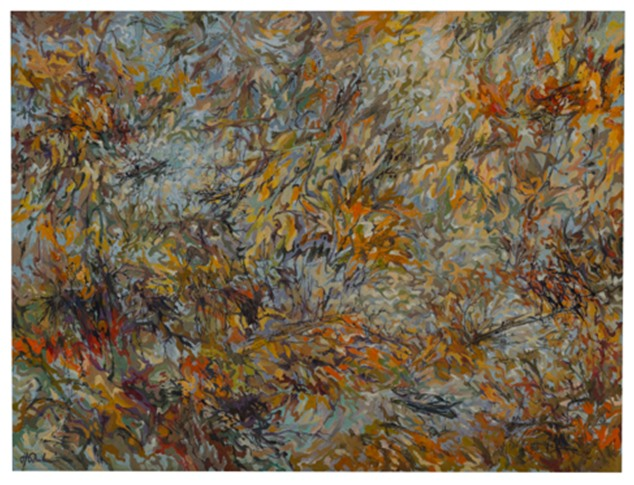 Sound of Nature, the largest painting in this exhibition (212cm by 282cm), was hailed as "the best work of this new series" by Bùi Quang Thắng, artistic director at Vicas Art Studio. “Normally with large paintings, artists apply strong colours and bold lines to create strong visual impressions, but Hoàng Định did the exact opposite. His strokes are small, only 1-2cm with different tones and colours. Thắng also linked Định’s style to the Rayonism movement in the early 20th century. “While Rayonism works often featured sharp coloured streaks which interlaced and overlapped each other, Hoàng Định uses small, soft and curving lines. Rayonism paintings were not figurative while Định’s are," said Thắng.